Winter months are an important time in the garden. The shorter days bring a regeneration period for plants and the pollinators that will also emerge in spring. As we tend winter gardens or wait for the spring thaw, there are things we can do now to encourage healthy wildlife, come spring. Here are a few facts and tips gleaned from Master Gardeners across the state. As you plan your spring garden, try to imagine it from a bird's eye view. Pollinators are attracted to large swaths of color. Arrange butterfly and bee-attracting flowers in clusters. Introducing a mix of ground-level and taller plants helps provide shelter and wind-screen for beneficial insects. Cut out the pesticides, if possible, and opt for California native plants. An important example is narrow-leaf milkweed (Asclepias fascicularis). 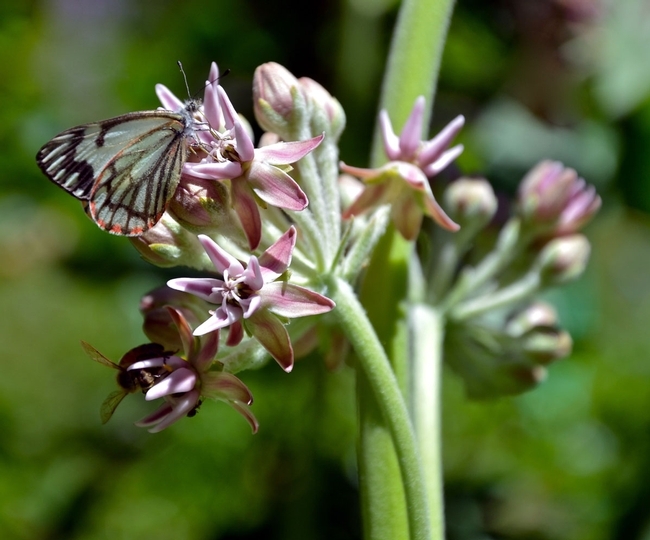 Researchers have found that the brightly colored tropical milkweed (Asclepias curassavica) can carry a debilitating parasite that endangers native monarchs. Migrating species, especially monarch butterflies, are best adapted to native flora: https://monarchjointventure.org/. Though we can't observe them, many native bees spend the winter dormant in the garden. Both mason bees and bumblebees nest underground. Carpenter bees and other insect allies burrow in wood during colder months. With this in mind, it's a good idea to keep some areas of “leaf litter” and dead wood on the property. If well managed, small brush, tree stumps and snags (dead trees) can be a benefit, rather than an an eyesore or hazard. Butterflies are with us through four cycles of their lives: egg; larval; pupa/chrysalis and adult. Many species over-winter in the garden, hidden amid the foliage. If you've discovered a chrysalis in the garden, you've seen an example of nature's delicate processes. Adult butterflies need water, but because they can't drink from an open water source, gardeners will sometimes create “mud baths” by irrigating the soil near their flower beds. A more contained water source can be made of a bucket, filled with sand. Bury the bucket to the rim, and top-off with water. In springtime, add some sticks or leaves that the butterflies can use as perches, and watch who comes to drink. Do hummingbirds stick around all winter? Recent studies show that some varieties of hummingbird stay in Southern California, rather than flying south, in winter. Experts who once advised that we remove nectar feeders around Labor Day, now say it's okay to provide food all winter. 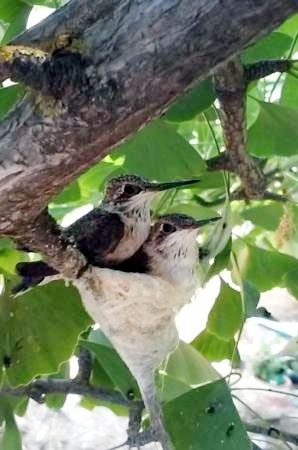 Anna's and Allen's hummingbirds now stay year-round, and they may even nest in the colder months. To fill feeders, boil and cool a 4:1 mixture of water and sugar (skip the dye). To keep feeders mold-free, clean them weekly with white vinegar, or warm, soapy water. Citizen science projects help researchers track bird migration patterns. Gardeners can join these efforts, like the Audubon Society's Great Backyard Bird Count, set for February 15-18: http://gbbc.birdcount.org/. Seeds are ripe when they shake in the pod, are easily removed from the plant, and/or are turning dark in color. Fall is seed-gathering time in the mountains. Over the past few years, San Bernardino Master Gardeners have begun to highlight seed-sharing, both as part of the Master Gardener mission, and our service to communities. With its hub at Chino Basin Waterwise Community Center, in Montclair, the San Bernardino County Regional Seed Library (SBRSL) also has satellite libraries in Yucaipa and the San Bernardino Mountains. The mountains seed library, still in its infancy, was created with the idea of connecting mountain residents through a shared love of wild-scape gardening. Getting Started The Rancho Santa Ana Botanic Garden hosts a seed conservation project that is a good model for our regional seed harvesting. 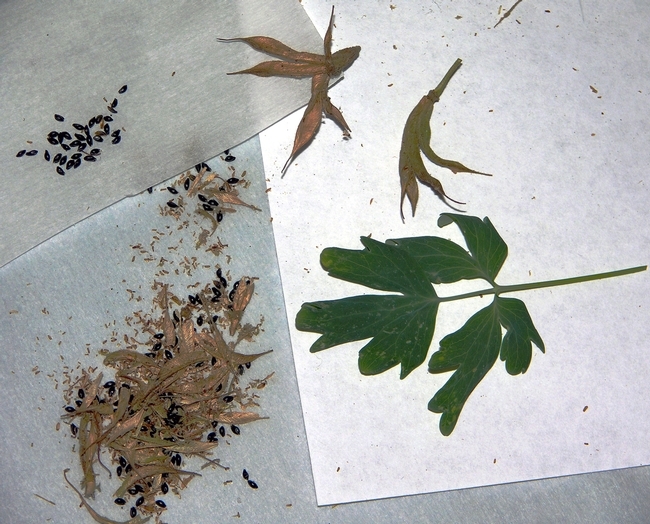 As a resource, RSABG offers techniques related to collecting and propagating native seeds. The first step, according to the experts, is to identify available plants and select the ones you want to collect. For help knowing our mountain plants, the Rim of the World Interpretive Association (ROWIA)/Heaps Peak Arboretum publishes illustrated guidebooks on native plants and trees. 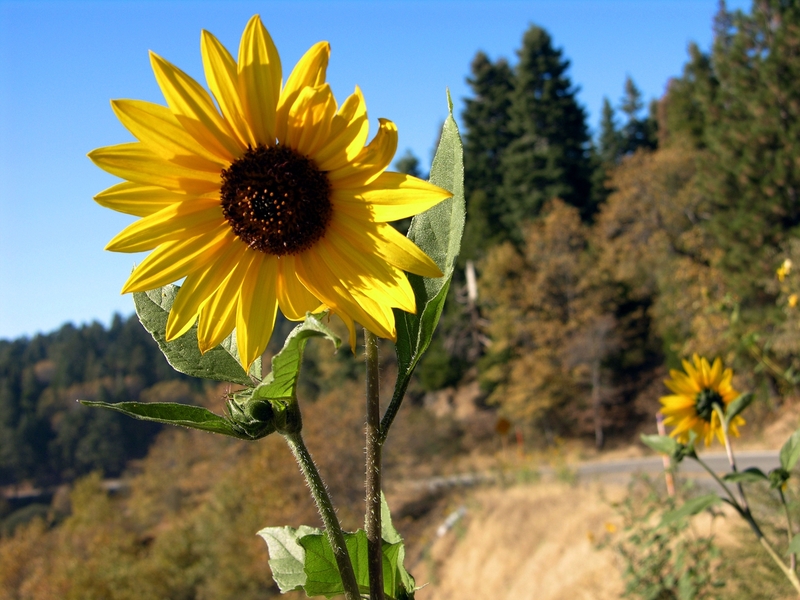 In addition to print sources, online sites like the Calflora and Calscape offer plant finders, maps, color photos, and planting guides. When selecting which seeds to harvest, it's important to know, for example, which plants are best adapted to our area, which ones are truly native, and which may be invasive species. 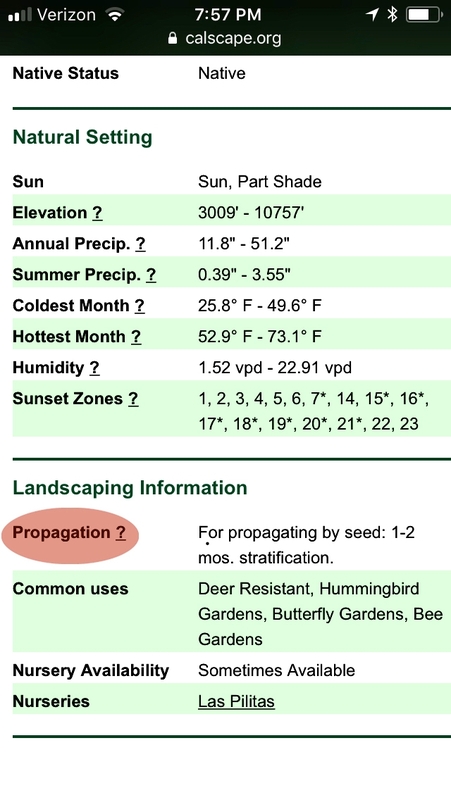 Calscape's harvest and propagation guides make the selection process easier. Native Seed Propagation Propagating native plants can be tricky, because special conditioning is sometimes required to mimic nature's processes. Some plants, for example, need weeks of cool weather before germinating. Others require fire. Some plants prefer being ingested by birds, bears or other critters. A process called stratification is needed for some varieties. This involves storing seeds in a damp, refrigerated environment (33 - 38°F) for 60-90 days, before they're ready to go into the soil. Other seeds require scarification, or the breaking down of husks by acid-washing, hot water baths, sandpaper rubs, or other processes. In talking with Master Gardeners I've heard both success stories, and mixed reviews when it comes to propagating native seeds. Master Gardener/ROWIA member Cori Edwards, of Crestline shared a plan to use pine needles as kindling over a container of fire-start seeds. Mountain gardeners' seed-germinating experiments can be off-beat and interesting, and they always make for good storytelling. This heat is stressing me (and my trees) out! I just returned from a 10-day camping vacation. It seems whenever I am away the temperature reaches triple digits. This year proved no different, except wondering how our recently planted citrus and avocado grove on the very exposed south side of the house endured. When we planted the young trees this spring, all sorts of folks felt the need to pull their cars up to the curb and tell us what a bad idea it was to plant trees where they would get sun and wind exposure. We smiled and said, “thank you!” not fully understanding the impact of our tree placement. When we returned from our trip and drove up to the house, we were happy to see the citrus trees were doing just fine, but those avocado trees were totally stressed out! Newly planted trees are the most heat-susceptible plants. The roots have not had a chance to become established. 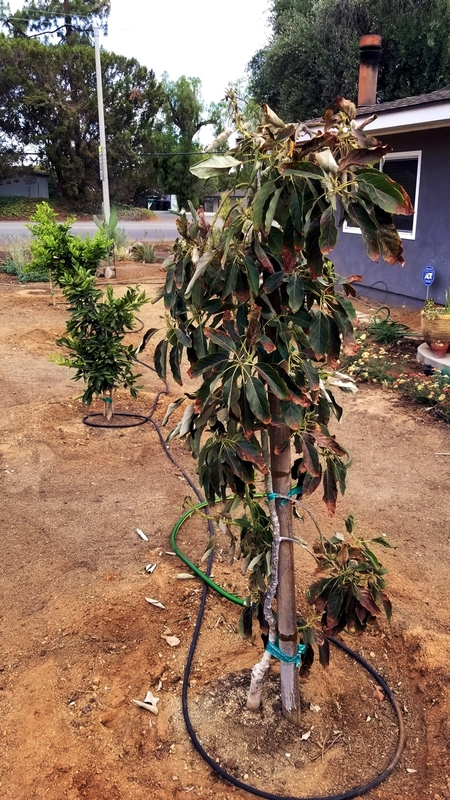 Turns out citrus and avocado thrive in my climate zone; however, it would be helpful to shade them from the sun and wind while they are young. 2. Before we left, I established a regular watering program with drip hoses and a timer as I have not yet installed my permanent irrigation. It is best to water early in the morning. Keep the tree trunk dry and water outward toward the drip line of the tree. There is a condition called ''physiological stress' which results from a plant losing water (from transpiration) faster than water can be taken up by the roots, even if enough water is available. This occurs often late in the afternoon of a hot day. Further watering will not help and can lead to root rot unless the roots are truly dry! Check the roots several inches deep to find out how dry the soil actually is. 3. Mulch would have been very helpful, and I neglected to apply the desired 3-4 inches. Keep mulch several inches away from the trunk and remember to replenish it as it breaks down. The mulch keeps soil moisture in and weeds out and buffers soil temperature reducing heat stress. 4. Once trees are stressed from drought or heat, they often succumb to other stressors, such as insects and fungal diseases. Keeping trees healthy is essential. I will need to keep a closer eye on these trees while they recover. While avocado and citrus are traditionally grown in where I live, there may have been better choices. On the UC ANR Green Blog, ‘UC study seeks street trees that can cope with climate change' is a very interesting piece y authored by Jeannette E. Warnert, reporting on an ongoing research study by UC Cooperative Extension scientists partnering with the U.S. Forest Service. The article also provides a sampling of trees that are part of the study. The following two sites are useful for tree selection for your climate zone: http://calscape.org/(natives) and https://selectree.calpoly.edu/(natives and compatible non-natives). Sandy Szukalski and I enjoyed a visit to the McKinley Elementary School Garden this past week. Virgina 'Gin' McMillin, the Garden Director had an amazing amount of enthusiasm for the garden, the children, her IERCD grant, the future pollinator garden and just the future of the McKinley school garden in general is was infectious! Gin asked us to come visit so she could show us her failing pumpkin plants and get some advice. It seemed as if the plants were not going to thrive. They were undersized, yellowing, and had a bit of fungus. The pumpkins were planted by the children on Earth Day (late April). The school district had provided a 50/50 mix, but it seems as if it was not very nutritious and may have had unhealthy plant material. The plants were also planted too close together for pumpkins. - Build up mounds for each plant - plant mid-July - August depending on growth projections. If pumpkins ripen on the vine too early they may get fungal rot. - Plant plants 6-8' apart, using 3-5 seeds in each mound. Heavily mulch. -Introduce nice soil to the pumpkin mounds. Especially if your current soil is not very nutritious. - Use mulch to help keep moisture in and reduce weeds. That will also provide a nice bed for pumpkins later. - Once plants germinate and are 2-3" tall, begin thinning out less healthy plants, leaving the healthies 2 plants. - Pumpkins need to be fed. Use nitrogen for early plant growth then when the plants are larger but before they bloom she should use phosphorus. Alternatively, you can use the more easily accessible forms such as coffee grains or manure. Feed at regular intervals. - Water in the morning (keeping the soil moist until germination), and if it gets very hot, in the afternoon as well. Water deeply 1". - Be patient for fruit - mail and female blossoms are needed. Don't use insecticide. The plant needs bees. - Snip off fuzzy ends of vine after a few pumpkins have formed to focus plant energy on fruit. Pruning vines will help with that as well. As fruit develops, turn (with great care) to encourage nice shape. Slip a thin board or plastic mesh under pumpkins to protect them. - There is an excellent problem diagnosis for pumpkins from 'California Master Gardener Handbook', page 394 and a list of recommended varieties from page, 395. This book - it has a wealth of information! Happy Gardening - stay hydrated! Encouraging healthy bee populations has long been part of the Master Gardener mission. In our study of Integrated Pest Management (IPM), we learn that chemical pesticides can do harm to entire food chains, from plants to insects, and other wildlife. With bee colony health very much in the news, many gardeners are surprised to learn that in addition to the European honey bee, California is home to hundreds of species of native bees, many of whom reside in solitary nests, hidden in plain sight around our gardens. On a recent walk through a local apple grove, I was excited to identify four – maybe five types of native bee hovering in the blossoms alongside the honey bees. We know that plants and bees rely on one another for their existence. Recent studies published by the UC Cooperative Extension can help us recognize our native species, and help raise awareness about preserving bee habitats. How do we identify native bees in the garden? The 2009 report Native Bees are a Rich Resource in Urban California Gardens presents findings of a UCANR study done in collaboration with the North American Pollinator Protection Campaign and the Xerces Society. Over three years, scientists surveyed bees in seven urban areas across the California, including La Cañada-Flintridge, near Pasadena. Of an estimated 1600 native species currently known in California, 60 to 80 species were observed, along with the plants that attract them. The study shows which native bees are likely to show up in our gardens. Of the species counted, the most common was the ultra-green sweat bee (Agapostemon texanus). To spot this bee it's important to look closely. With its smooth green body and slender shape, the sweat bee can be mistaken for a fly. The photos from the UC study by Rollin Coville (©2009) show a female ultra-green sweat bee (above) and a male (below) as they feed on native blooms. Another common visitor, the leafcutting bee (Megachile perihirta) has a distinctive mandible designed for chomping stems and leaves. 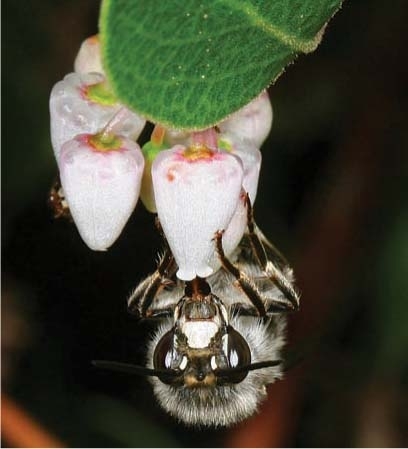 The digger bee (Anthropora edwardsii) is prevalent in Southern California and is specifically adapted to the tiny flowers of the native manzanita (photo at top of article) (Arctostaphylos sp.). Like many native bees, the digger bee is solitary. The female prefers dark quiet places to lay her eggs, and makes her nest in dead wood, or in the ground. Unlike the male of most bee species, females have specially formed hind legs made for gathering pollen. During springtime's brief blooms, native bees can be seen going from flower to flower loaded up with the golden powder. This solitary bee (Svasta obliqua expurgata) is a muli-tasker, as she simultaneously sips nectar and collects pollen on a coneflower (Echinacea pupura). The native bees to look for in our gardens this season include those counted in the study: mining bees (Andrena angustitarsata); digger bees (Anthrophora); and three bumblebee varieties (Bombus), California, black-tip and yellow-faced. Others bees found include carpenter bees (Ceratina); gray digger bees (Habropoda depressa) and long-horn digger bees (Melissodes), as well as squash bee (Peponapis pruinosa); cuckoo bees (Xeromelecta californica); large carpenter bees (Xylocopta tabaniformis incompletes); leafcutting bees (Megachile); mason bees (Osmia coloradensis); and the blue orchard bee (Osmia lignaria propinqua). All photos are by Rollin Coville (© 2009), used by permission of the Regents of the University of California.